Soy Sauce Organic Tamari Wheat Free Clearspring - HealthySupplies.co.uk. Buy Online. Double strength, dark soya sauce. Aged slowly in Cedarwood kegs. Produced by the award-winning Japanese Sendai brewery. 500ml bottle (large bottle - ideal for catering). Tamari soy sauce is wheat-free and gluten-free. This organic tamari from Clearspring is double-strength (fermented over two summers) and aged in cedarwood kegs. It is a real treat to the taste buds! 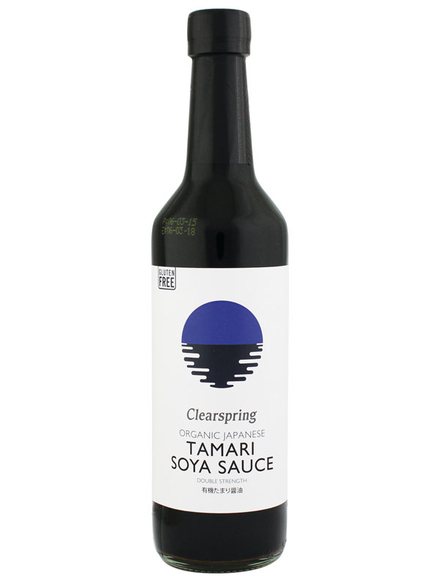 Clearspring Tamari Soya Sauce is made of the highest quality, using old traditional Japanese craft-made methods. Because of the slow aging process and methods used, Clearspring soya sauces have won numerous awards for their rich and interesting flavours. Clearspring's whole soya beans are fermented in cedarwood kegs for over 15 months, then placed in pressing sacks which are wrapped by hand. No chemicals are used and neither are GM ingredients. The resulting Tamari soya sauce is of much superior quality compared to the mass produced, cheap soy sauces found in most supermarkets. Because Tamari does not contain wheat, it does not naturally produce alcohol. Usually, the alcohol in Shoyu soya sauces acts as a preservative. The preservative used in Clearspring's Organic Tamari is mirin (a sweet vinegar made from rice, cultured rice & water). Whole soya beans* 46%, water, sea salt, mirin* (sweet rice*, water, cultured rice*).